Available as low as $1.99 per oz over spot! An exciting new product from the Native American Mint marks a new venture for the facility as it releases its first-ever silver bullion coin. The 2015 1 oz Silver Sioux Buffalo coin is a bullion product issued a face value by the Native American Mint, authorized by the Oglala Sioux Tribe of Pine Ridge. 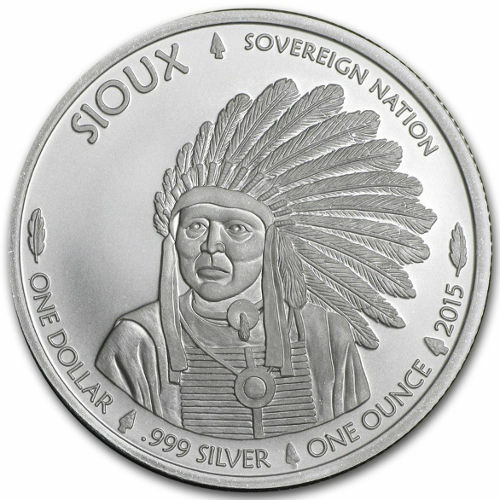 Right now, the 2015 1 oz Silver Sioux Buffalo Coin is available for purchase on Silver.com. First-ever silver bullion coin from the Native American Mint! Arrives in an individual protective plastic flip, plastic tubes of 20, or boxes of 500. Bears a face value of One Dollar authorized by the Oglala Sioux and the Native American Mint. Obverse depicts a tribal Sioux chieftain in military headdress, circa 1860. Reverse features an animal that was the lifeblood of Sioux culture: the Buffalo. The Native American Mint specializes in the celebration of Native American tribal art, which has graced the face of coinage for more than 400 years in North America. Although little known in many cases, tribal art has appeared on coinage on this continent longer than the existence of the United States Mint. Each of these 2015 1 oz Silver Sioux Buffalo Coins has been issued a One Dollar face value by the Native American Mint and the Oglala Sioux tribe, but under federal law, the United States Mint is the only facility with the authority to issue US legal tender coins. However, this silver bullion coin is an exciting precious metal product and the only American, non-US government-issue coin on the market today. On the obverse of each coin you’ll find the front-facing portrait of a Sioux chieftain wearing full battle headdress commonly used by tribal leaders around 1860. Engravings identify the name of the tribe, and the coin’s face value, purity, metal content, weight, and year of issue. The reverse depicts the massive Buffalo, North America’s largest land mammal. The buffalo species used to roam freely throughout the American West, Midwest, and Plains regions. The Sioux tribes would follow the migrating creatures, using them as a source of food, clothing, and materials for shelter. 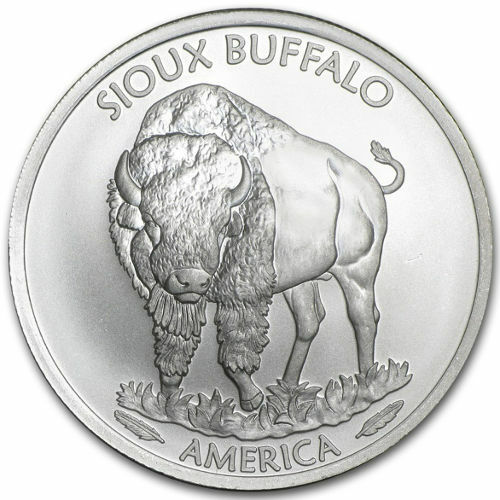 If you have any questions about these 2015 1 oz Silver Sioux Buffalo Coins, or other exciting Native American Mint products Silver.com now carries, please contact us. We’re available at 888-989-7223, online using our live chat, or via email.